Your office’s upholstery is one of the most important things for the look of your business. It is one of the first things a new client notices about your business and keeping it clean and looking great is guaranteeing new regulars. Kiwi’s upholstery commercial cleaning service is here to keep your business looking good for all to see when they walk through your doors. Our professional upholstery commercial cleaning services are all-natural, environmentally-friendly, gentle, and 100% effective. We provide you with an upholstery commercial cleaning that will have your employees, clients, and guests never wanting to leave! Kiwi’s professional upholstery commercial cleaning service technicians are fully licensed, bonded, and insured to clean any and all types of commercial upholstery. We have provided our commercial upholstery cleaning services for 30 years, so our services are not only professional, but distinguished as well. Our customer service is unmatched by any of our competitors, and our upholstery commercial cleaning KIWI Lovers are always 100% satisfied with our services, and we know you will be too! We offer you a 30-day clean guarantee to ensure that your building is treated with the full KIWI commercial cleaning experience. KIWI knows how important it is to keep your business looking good at an economical price, and by using our services instead of an in-house maintenance crew, you are able to write off the full cost of the services as guaranteed by the IRS, instead of a partial cost for in-house maintenance. We also provide all of our services at a price that can’t be beat by our competitors. Choosing KIWI is not only the smart choice for your business, but the best as well. 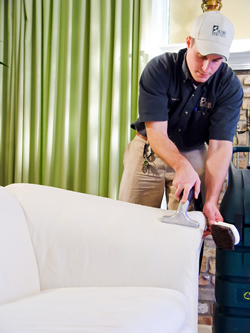 Our upholstery commercial cleaning services are professional, client-focused, and done to perfection. If you need to have your business’ upholstery cleaned, contact your local KIWI commercial upholstery cleaning service provider.